This post is sponsored by Instinct® and the BlogPaws Professional Pet Blogger Network. I am being compensated for helping spread the word about Instinct® Raw Boost® Mixers but Pawsitively Pets only shares information we feel is relevant to our readers. Instinct is not responsible for the content of this article. If you are looking to enhance your dog's dry food diet with something extra special, freeze dried raw food is a great option. Not sure where to find something like this? It's easy! 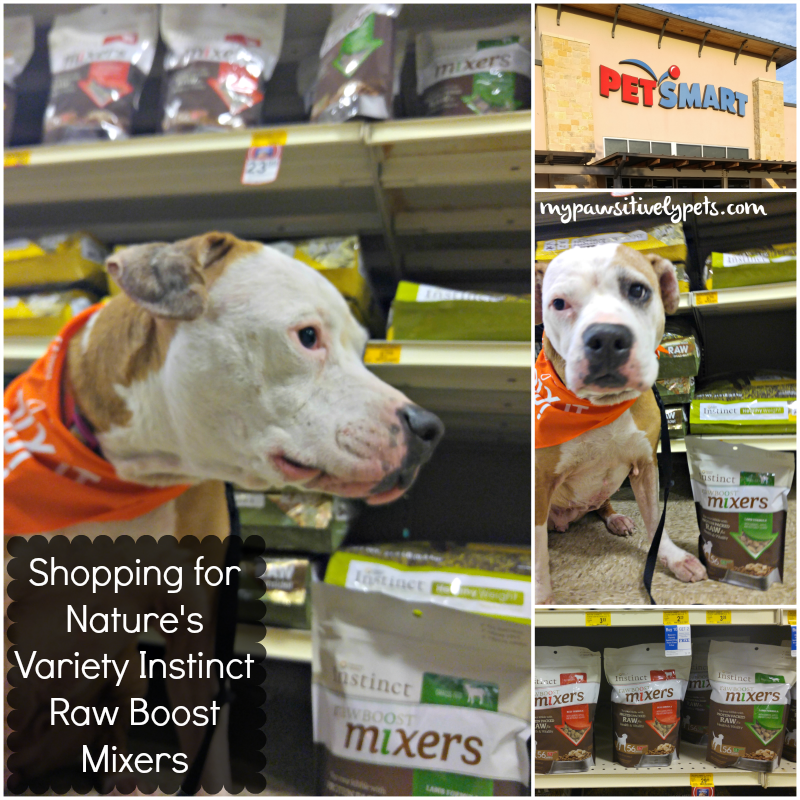 We took a shopping trip to our local PetSmart and picked up a bag of Nature's Variety Instinct® Raw Boost® Mixers. These freeze-dried bits of meat enhance your dog's regular meals with all natural, grain-free animal protein including Chicken, Beef, and Lamb. 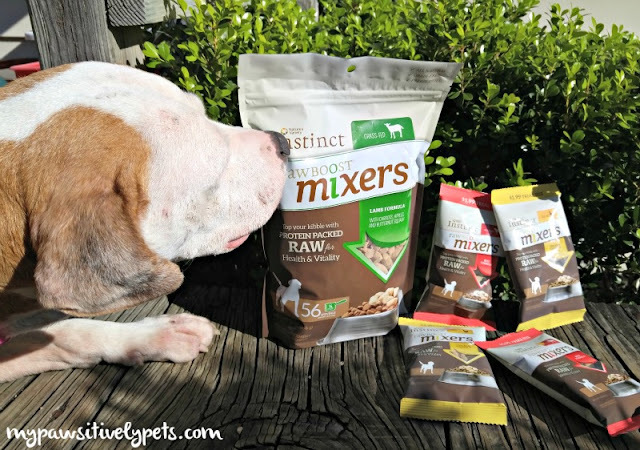 Nature's Variety Instinct Raw Boost Mixers are formulated to mirror your dog's ancestral diet. 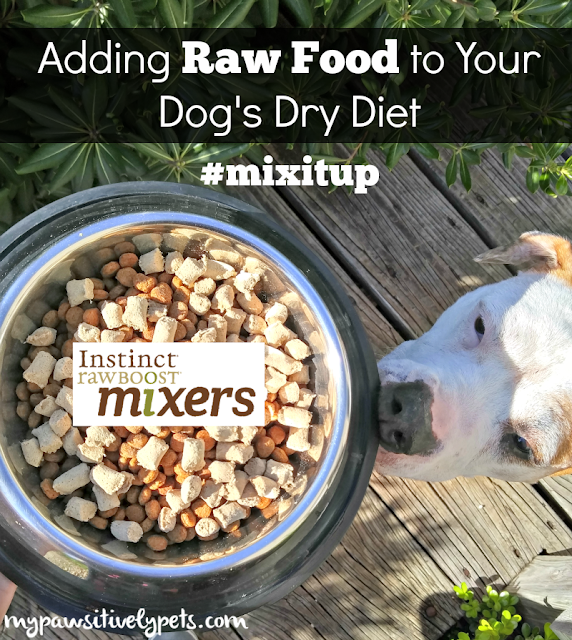 Even if you aren't ready to make a complete switch from a dry diet to a raw diet, Nature's Variety Instinct Raw Boost Mixers are an excellent way to get your feet wet. At PetSmart, Shiner sniffed her way to the food aisle with Nature's Variety. It was pretty easy to find. The Nature's Variety Instinct Raw Boost Mixers were right next to a freezer with the Nature's Variety frozen raw food. So what flavor did Shiner choose? After much sniffing about, she decided that Lamb was her favorite. 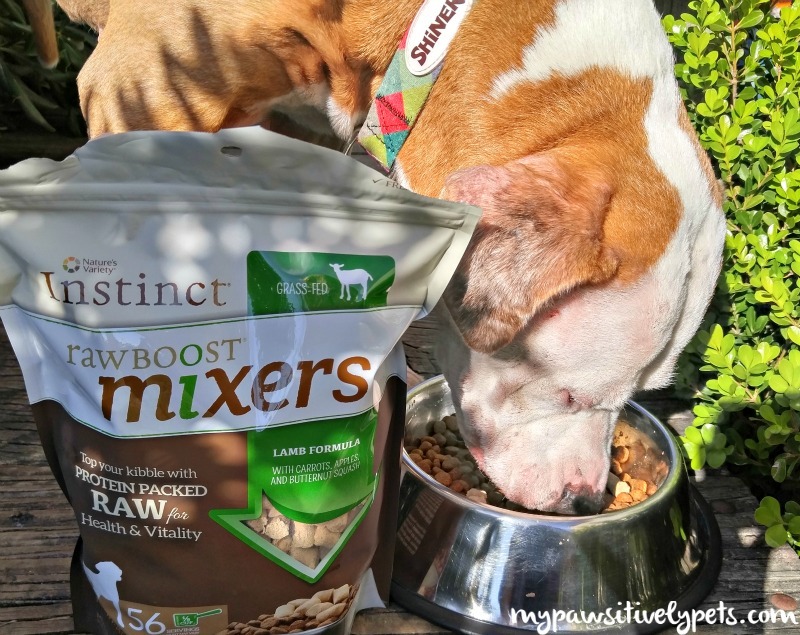 Nature's Variety Instinct Raw Boost Mixers are also available in a trial size that is perfect for seeing which flavor your dog will like the most. The trial size is normally $1.99, but they were on sale for 3 for $5 at our PetSmart. The larger bags were also on sale. After our visit to PetSmart, Shiner couldn't wait to get home to try her new Nature's Variety Instinct Raw Boost Mixers. It's meant to be used as a meal topper to your dog's regular food. You just add some of the freeze-dried pieces on top of your dog's food according to the feeding guidelines and watch their eyes light up when as they dig in. Shiner weighs over 40 pounds, so she can have 1/4+ cup added to her kibble dry diet twice a day according to the package label. The natural ingredients feature optimal nutrient absorption and oils for a healthy skin and coat. Nature's Variety Instinct Raw Boost Mixers doesn't need to be frozen or refrigerated, so you can save valuable freezer space. This is especially handy if you don't have any extra freezer space (like me). Shiner will be topping her meals with this food for the next few weeks, and she'll be sure to tell you what she thinks about it soon. But, from what I hear she likes the way it tastes so far. Next time you are at PetSmart, look for Nature's Variety Instinct Raw Boost Mixers. You can also find them online at PetSmart HERE. Stay up to date with Nature's Variety Instinct on Facebook too! Has your dog tried raw food before? Tell us what they thought of it in the comments! We eat raw infused kibble, and have been for about a year, but now we are trying these as well, and we sometimes use them as rewards for our training. Good stuff! We've used the Instinct mixers for cats. The mom crumbles them up and mixes it into our canned foods. I've tried some of the raw cat treats before too. Callie tried a piece of Shiner's Mixers and seemed to like it. 40 pounds? Now why da kittens don't they make dat size fur cats? You know all da raw peeps fink a 5 ounce bag is all a kitty needs. what? Do they think we all weigh 2 pounds? MOL Glad yoous liked 'em. Enjoy. Gweat post. Oh! That is Shiner's size haha! I believe that the bag we got her was around 14 oz. Shiner is becoming a culinary expert! Looks good and sounds yummy, enjoy my friend! Those are great for those who don't want, or who cannot afford, to switch completely over to raw. The freeze-dried meats add a punch of health benefits! Oz eats a completely raw diet. I think we will try this mix up. I love that this encourages folks to feed some raw! Excellent review and a great way to give a boost of raw nutrition to your dog's diet! The dog in the image - It's coat and skin doesn't look very healthy at all!! Well thanks! That's my dog :) (Yes, real human beings do write these things.) The reason her skin looks like that is because she is experiencing her twice yearly seasonal allergies, with quite a bad spell. And believe it or not, she had just finished a 2 month trial of a raw diet.